The Nintendo GameCube[b][c] is a home video game console released by Nintendo in Japan and North America in 2001 and Europe and Australia in 2002. The sixth-generation console is the successor to the Nintendo 64, designed to compete with Sony's PlayStation 2 and Microsoft's Xbox (after the Sega Dreamcast was discontinued). The GameCube is the first Nintendo console to use optical discs as its primary storage medium. The discs are in the miniDVD format and the system was not designed to play full-sized DVDs or audio CDs, unlike its competitors, and focused on gaming instead. The console supports online gaming for a small number of games via a GameCube broadband or modem adapter and can connect to a Game Boy Advance with a link cable, which allows players to access exclusive in-game features using the handheld as a second screen and controller. The GameCube uses composite video cables to display games on the television; however, there are differences in the two GameCube models. The models produced before May 2004 also had the ability to use digital component AV cables and progressive scan and a second serial port. The nameplate on the top of the console with the words "Nintendo GameCube" could be removed. This model was known as DOL-001. All those features were removed in GameCube consoles produced between 2004-2007; the later model was known as DOL-101. The newer model had firmware that disabled Action Replay cheats and cheat codes and the disc-reading laser was improved in many ways, though it did not last as long. The newer model came with a 48-watt AC adapter to power the console, while the original was 46 watts. Reception of the GameCube at the time was generally positive. The console was praised for its controller, extensive software library and high-quality games, but was criticized for its exterior design and lack of features. Nintendo sold 21.74 million GameCube units worldwide before the console was discontinued in 2007. Its successor, the seventh-generation Wii (some models of which have backward compatibility with most GameCube software), was released in November 2006. Partnering with Nintendo in 1998, ArtX began the complete design of the system logic and of the graphics processor (codenamed "Flipper") of Nintendo's sixth-generation video game console, reportedly bearing the early internal code name of "N2000". At Nintendo's press conference in May 1999, the console was first publicly announced as "Project Dolphin", the successor to the Nintendo 64. Subsequently, Nintendo began providing development kits to game developers such as Rare and Retro Studios. Nintendo also formed a strategic partnership with IBM, who created the Dolphin's CPU, named "Gekko". The console was announced as the GameCube at a press conference in Japan on August 24, 2000, abbreviated as "NGC" in Japan and "GCN" in North America. Nintendo unveiled its software lineup for the sixth-generation console at E3 2001, focusing on fifteen launch games, including Luigi's Mansion and Star Wars Rogue Squadron II: Rogue Leader. Several games originally scheduled to launch with the console were delayed. It is also the first console in the company's history not to accompany a Super Mario platform game at launch. Long before the console's launch, Nintendo had developed and patented an early prototype of motion controls for the GameCube, with which developer Factor 5 had experimented for its launch games. An interview quoted Greg Thomas, Sega of America's VP of Development as saying, "What does worry me is Dolphin's sensory controllers [which are rumored to include microphones and headphone jacks] because there's an example of someone thinking about something different." These motion control concepts would not be deployed to consumers for several years, until the Wii Remote. Prior to the GameCube's release, Nintendo focused resources on the launch of the Game Boy Advance, a handheld game console and successor to the original Game Boy and Game Boy Color. As a result, several games originally destined for the Nintendo 64 console were postponed in favor of becoming early releases on the GameCube. The last first-party game in 2001 for the Nintendo 64 was released in May, a month before the Game Boy Advance's launch and six months before the GameCube's, emphasizing the company's shift in resources. Concurrently, Nintendo was developing software for the GameCube which would provision future connectivity between it and the Game Boy Advance. Certain games, such as The Legend of Zelda: Four Swords Adventures and Final Fantasy Crystal Chronicles, can use the handheld as a secondary screen and controller when connected to the console via a link cable. Nintendo began its marketing campaign with the catchphrase "The Nintendo Difference" at its E3 2001 reveal. The goal was to distinguish itself from the competition as an entertainment company. Later advertisements push the slogan, "Born to Play", and video game commercials feature a rotating cube animation that morphs into a GameCube logo and ends with a voice whispering, "GameCube". On May 21, 2001, the console's launch price of US$199 was announced, US$100 lower than that of the PlayStation 2 and Xbox. On April 22, 2002, veteran third party Nintendo console developer Factor 5 announced its 3D audio software development kit titled MusyX. In collaboration with Dolby Laboratories, MusyX provides motion-based surround sound encoded as Dolby Pro Logic II. In February 2007, Nintendo announced that it had ceased first-party support for the GameCube and that the console had been discontinued, as it was shifting its manufacturing and development efforts towards the Wii, Nintendo DS and Game Boy Advance. We thought about the developers as our main customers. In particular for GameCube, we spent three years working with Nintendo of America and with all sorts of developers, trying to understand the challenges, needs, and problems they face. First among these is the rising cost of development. The GameCube can see high performance without too much trouble; it isn't a quirky design, but a very clean one. It was important we didn't require jumping through hoops for high performance to be achieved. On top of that, it is rich in features, and we worked to include a dream group of technical features that developers requested. Initiating the GameCube's design in 1998, Nintendo partnered with ArtX (then acquired by ATI Technologies during development) for the system logic and the GPU, and with IBM for the CPU. IBM designed a PowerPC-based processor with custom architectural extensions for the next-generation console, known as Gekko, which runs at 485 MHz and features a floating point unit (FPU) capable of 1.9 GFLOPS. The processor was designed in IBM's 0.18 μm CMOS technology, which features copper interconnects. Codenamed "Flipper", the GPU runs at 162 MHz and, in addition to graphics, manages other tasks through its audio and input/output (I/O) processors. The GameCube introduced a proprietary miniDVD optical disc format as the storage medium for the console, capable of storing up to 1.5 GB of data. The technology was designed by Matsushita Electric Industrial (now Panasonic Corporation) which utilizes a proprietary copy-protection scheme—different from the Content Scramble System (CSS) found in standard DVDs—to prevent unauthorized reproduction. The Famicom Data Recorder, Famicom Disk System, SNES-CD, and 64DD had explored various complementary storage technologies, but the GameCube was Nintendo's first console to move away from cartridge-based media altogether. The GameCube's 1.5 GB mini-disc have sufficient room for most games, although a few games require an extra disc, higher video compression, or removal of content present in versions on other consoles. By comparison, the PlayStation 2 and Xbox, also sixth-generation consoles, both use 8.5 GB Dual-Layer DVDs. Like its predecessor, the Nintendo 64, GameCube models were produced in several different color motifs. The system launched in "Indigo", the primary color shown in advertising and on the logo, and in "Jet Black". A year later, Nintendo released a "Platinum" limited-edition GameCube, which uses a silver color scheme for both the console and controller. A "Spice" orange-colored console was eventually released as well only in Japan, though the color scheme could be found on controllers released in other countries. Nintendo developed stereoscopic 3D technology for the GameCube, and one launch game, Luigi's Mansion, supports it. However, the feature was never enabled outside of development. 3D televisions were not widespread at the time, and it was deemed that compatible displays and crystals for the add-on accessories would be too cost-prohibitive for the consumer. Another unofficial feature are two audio Easter eggs that can be invoked when the console is turned on. When the power is activated with the "Z" button on the Player 1 controller held down, a more whimsical startup sound is heard in place of the standard one. With four controllers connected, holding down the "Z" button on all four simultaneously produces a "ninja-like" tune at startup. The GameCube features two memory card ports for saving game data. Nintendo released three official memory card options: Memory Card 59 in gray (512 KB), Memory Card 251 in black (2 MB), and Memory Card 1019 in white (8 MB). (These are often advertised in megabits instead: 4 MB, 16 MB, and 64 MB, respectively.) A few games were known to have compatibility issues with the Memory Card 1019, and at least two games have save issues with any size. Memory cards with larger capacities were released by third-party manufacturers. Nintendo learned from its experiences—both positive and negative—with the Nintendo 64's three-handled controller design and went with a two-handled, "handlebar" design for the GameCube. The shape was made popular by Sony's PlayStation controller released in 1994 and its follow-up DualShock series of gamepads introduced in 1997. In addition to vibration feedback, the DualShock series was well known for having two analog sticks to improve the 3D experience in games. Nintendo and Microsoft designed similar features in the controllers for their sixth-generation consoles, but instead of having the analog sticks parallel to each other, they chose to stagger them by swapping the positions of the directional pad (d-pad) and left analog stick. 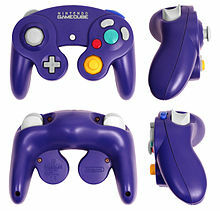 The GameCube controller features a total of eight buttons, two analog sticks, a d-pad, and an internal rumble motor. The primary analog stick is on the left with the d-pad located below and closer to the center. On the right are four buttons: a large, green "A" button in the center, a smaller red "B" button to the left, an "X" button to the right, and a "Y" button at the top. Below and to the inside is a yellow "C" analog stick, which often serves a variety of in-game functions, such as controlling the camera angle. The Start/Pause button is located in the middle, and the rumble motor is encased within the center of the controller. Unique to the GameCube is the controller's prominent size and placement of the A button. Having been the primary action button in past Nintendo controller designs, it was given a larger size and more centralized placement for the GameCube. The rubberized analog stick in combination with the controller's overall button orientation was intended to reduce the dreaded "Nintendo thumb"—a term used to describe pain in any part of the hands, wrists, forearms, and shoulders as a result of long-term play. In 2002, Nintendo introduced the WaveBird Wireless Controller, the first wireless gamepad developed by a first-party console manufacturer. The RF-based wireless controller is similar in design to the standard controller. It communicates with the GameCube by way of a wireless receiver dongle connected to one of the console's controller ports. Powered by two AA batteries, which are housed in a compartment on the underside of the controller, the WaveBird lacks the vibration functionality of the standard controller. In addition to the standard inputs, the WaveBird features a channel selection dial—also found on the receiver—and an on/off switch. An orange LED on the face of the controller indicates when it is powered on. The controller is available in light grey and platinum color schemes. The GameCube is unable to play games from other Nintendo home consoles, but with the Game Boy Player attachment, it is able to play Game Boy, Game Boy Color, and Game Boy Advance games. The GameCube's successor, the Wii, supports backward compatibility with GameCube controllers, memory cards, and games. However, later revisions of the Wii—including the "Family Edition" released in 2011 and the Wii Mini released in 2012—dropped support for all GameCube hardware. A hybrid version of the GameCube with a commercial DVD player, called Q, was developed by Panasonic as part of the deal struck with Nintendo to develop the optical drive for the original GameCube hardware. Featuring a completely revised case, the Q overcomes the size limitation of the original GameCube's miniDVD tray by adding a commercial DVD-sized tray, among other hardware revisions. Released exclusively to Japan in December 2001, low sales resulted in the Q being discontinued in December 2003. In its lifespan of 2001—2007, more than 600 games were released for the GameCube. Nintendo is traditionally recognized for releasing innovative, first-party games, most notably from the Super Mario and The Legend of Zelda series. These first-party series continued on the GameCube and bolstered the console's popularity. As a publisher, Nintendo also focused on creating new franchises, such as Pikmin and Animal Crossing, and renewing some that skipped the Nintendo 64 platform, most notably the Metroid series with the release of Metroid Prime. The console also saw success with the critically acclaimed The Legend of Zelda: The Wind Waker and Super Mario Sunshine, and its best-selling game, Super Smash Bros. Melee, which sold 7 million copies worldwide. Though committed to its software library, however, Nintendo was still criticized by some for not featuring enough games during the console's launch window. Early in Nintendo's history, the company had achieved considerable success with third-party developer support on the Nintendo Entertainment System and Super NES. Competition from the Sega Genesis and Sony's PlayStation in the 1990s changed the market's landscape, however, and reduced Nintendo's ability to obtain exclusive, third-party support on the Nintendo 64. The console's cartridge-based media was also increasing the cost to manufacture software, as opposed to the cheaper, higher-capacity optical discs used by the PlayStation. With the GameCube, Nintendo intended to reverse the trend as evidenced by the number of third-party games available at launch. The new optical disc format introduced with the GameCube increased the capacity significantly and reduced production costs. The strategy mostly worked. High-profile exclusives such as Star Wars Rogue Squadron II: Rogue Leader from Factor 5, Resident Evil 4 from Capcom, and Metal Gear Solid: The Twin Snakes from Konami were very successful. Sega, which focused on third-party development following the demise of its Dreamcast console, offered a vast amount of support for the GameCube porting old favorites over such as Crazy Taxi and Sonic Adventure 2. The company also started new franchises on the GameCube including Super Monkey Ball. Several third-party developers were contracted to work on new games for existing Nintendo franchises, including Star Fox Assault by Namco and Wario World from Treasure. Some third-party developers, such as Ubisoft, THQ, Disney Interactive Studios, Humongous Entertainment and EA Sports, continued to release GameCube games well into 2007. A GameCube with a broadband adapter installed and a connected ethernet cable. ASCII Corporation produced a keyboard controller to help players communicate in Phantasy Star Online. Eight GameCube games support network connectivity, five with Internet support and three with local area network (LAN) support. The only Internet capable games released in western territories are three role-playing games (RPGs) in Sega's Phantasy Star series: Phantasy Star Online Episode I & II, Phantasy Star Online Episode I & II Plus, and Phantasy Star Online Episode III: C.A.R.D. Revolution. The official servers were decommissioned in 2007, but players can still connect to fan maintained private servers. Japan received two additional games with Internet capabilities, a cooperative RPG, Homeland and a baseball game with downloadable content, Jikkyō Powerful Pro Yakyū 10. Lastly, three racing games have LAN multiplayer modes: 1080° Avalanche, Kirby Air Ride, and Mario Kart: Double Dash. These three games can be forced over the Internet with third-party PC software capable of tunneling the GameCube's network traffic. To play online, players must install an official broadband or modem adapter in their system since the GameCube does not have out of the box network capabilities. Nintendo never commissioned any servers or Internet services to interface with the console, but allowed other publishers to do so and made them responsible for managing the online experiences for their games. The GameCube received generally positive reviews following its launch. PC Magazine praised the overall hardware design and quality of games available at launch. CNET gave an average review rating, noting that while the console lacks a few features offered by its competition, it is relatively inexpensive, has a great controller design, and launched a decent lineup of games. In later reviews, criticism mounted against the console often centering on its overall look and feel, describing it as "toy-ish." In the midst of poor sales figures and the associated financial harm to Nintendo, a Time International article called the GameCube an "unmitigated disaster." Retrospectively, Joystiq compared the GameCube's launch window to its successor, the Wii, noting that the GameCube's "lack of games" resulted in a subpar launch, and the console's limited selection of online games damaged its market share in the long run. Time International concluded that the system had low sales figures, because it lacked "technical innovations". In Japan, between 280,000 and 300,000 GameCube consoles were sold during the first three days of its sale, out of an initial shipment of 450,000 units. During its launch weekend, the GameCube sold $100 million worth of GameCube products in North America. The console was sold out in several stores, selling faster than both of its competitors, the Xbox and the PlayStation 2, had initially sold. The most popular game at the system's launch was Luigi's Mansion, which, according to Nintendo, sold more at launch than Super Mario 64 had. Other popular games include Star Wars Rogue Squadron II: Rogue Leader and Wave Race: Blue Storm. By early December 2001, the system had sold 600,000 units in the US. Nintendo sold 22 million GameCube units worldwide during its lifespan, placing it slightly behind the Xbox's 24 million, and well behind the PlayStation 2's 155 million. The GameCube's predecessor, the Nintendo 64, outperformed it as well, selling nearly 33 million units. The console was able to outsell the short-lived Dreamcast, however, which yielded 9.13 million unit sales. In September 2009, IGN ranked the GameCube 16th in its list of best gaming consoles of all time, placing it behind all three of its sixth-generation competitors: the PlayStation 2 (3rd), the Dreamcast (8th), and the Xbox (11th). As of March 31, 2003, the GameCube had sold 9.55 million units worldwide, falling short of Nintendo's initial goal of 10 million consoles. Many of Nintendo's own first-party games, such as Super Smash Bros. Melee and Mario Kart: Double Dash, saw strong sales, though this did not typically benefit third-party developers or directly drive sales of their games. Many cross-platform games—such as sports franchises released by Electronic Arts—were sold in numbers far below their PlayStation 2 and Xbox counterparts, eventually prompting some developers to scale back or completely cease support for the GameCube. Exceptions include Sega's family friendly Sonic Adventure 2 and Super Monkey Ball, which reportedly yielded more sales on GameCube than most of the company's games on the PlayStation 2 and Xbox. After several years of losing money from developing for Nintendo's console, Eidos Interactive announced in September 2003 that it would end support for the GameCube, canceling several games that were in development. Later, however, Eidos resumed development of GameCube games, releasing hit games such as Lego Star Wars: The Video Game and Tomb Raider: Legend. In addition, several third-party games originally intended to be GameCube exclusives—most notably Resident Evil 4—were eventually ported to other systems in an attempt to maximize profits following lackluster sales of the original GameCube versions. In March 2003, now-defunct UK retailer Dixons removed all GameCube consoles, accessories and games from its stores. That same month, another UK retailer Argos, cut the price of the GameCube in their stores to £78.99, which was more than £50 cheaper than Nintendo's SRP for the console at the time. With sales sagging and millions of unsold consoles in stock, Nintendo halted GameCube production for the first nine months of 2003 to reduce surplus units. Sales rebounded slightly after a price drop to US$99.99 on September 24, 2003 and the release of The Legend of Zelda: Collector's Edition bundle. A demo disc, the GameCube Preview Disc, was also released in a bundle in 2003. Beginning with this period, GameCube sales continued to be steady, particularly in Japan, but the GameCube remained in third place in worldwide sales during the sixth-generation era because of weaker sales performance elsewhere. Iwata told investors that the GameCube would sell 50 million units worldwide by March 2005, but by the end of 2006, it had only sold 21.7 million, selling fewer than half of what Nintendo forecasted. With the GameCube, Nintendo failed to reclaim the market share lost by its predecessor, the Nintendo 64. Throughout the lifespan of its console generation, GameCube hardware sales remained far behind its direct competitor the PlayStation 2, and slightly behind the Xbox. The console's "family-friendly" appeal and lack of support from certain third-party developers skewed the GameCube toward a younger market, which was a minority demographic of the gaming population during the sixth generation. Many third-party games popular with teenagers or adults, such as the blockbuster Grand Theft Auto series and several key first-person shooters, skipped the GameCube entirely in favor of the PlayStation 2 and Xbox. As of June 2003[update], the GameCube had a 13% market share, tying with the Xbox in sales but far below the 60% of the PlayStation 2. Many games that debuted on the GameCube, including Pikmin, Chibi-Robo!, Metroid Prime, and Luigi's Mansion became popular Nintendo franchises or subseries. ^ Japanese: ニンテンドー ゲームキューブ, Hepburn: Nintendō Gēmukyūbu? ^ "Nintendo reports record GameCube launch". CNET News. Retrieved March 16, 2013. ^ Martyn Williams (August 24, 2001). "Nintendo unveils Gamecube launch plans". CNN. Retrieved March 16, 2013. ^ "NEW MEDIA | GameCube price dropped". BBC News. April 22, 2002. Retrieved March 16, 2013. ^ a b "Consolidated Sales Transition by Region" (PDF). Nintendo. June 2011. Archived from the original (PDF) on July 28, 2011. Retrieved September 4, 2011. ^ "At Long Last, Nintendo Proclaims: Let the Brawls Begin on Wii!" (Press release). Nintendo. March 10, 2008. Archived from the original on March 13, 2008. Retrieved March 11, 2008. The previous installment in the series, Super Smash Bros. Melee, is the best-selling game for Nintendo GameCube with 7.09 million copies sold worldwide. ^ a b c d Buchner, Greg (October 29, 2001). "ATI Discusses GameCube Graphics" (Interview). IGN. Retrieved June 25, 2014. ^ a b c "Nintendo Press Conference Transcript". IGN. May 13, 1999. Retrieved June 25, 2014. ^ a b c Parker, Sam (June 6, 2001). "Nintendo tweaks GameCube's specs". ZDnet. Retrieved June 25, 2014. ^ a b "It's Alive!". IGN. March 12, 1999. Retrieved June 25, 2014. ^ "Say Hello to Project Dolphin". May 4, 1999. Retrieved July 8, 2013. ^ a b c d e f Rogers, Emily (January 7, 2014). "A Dolphin's Tale: The Story of GameCube". Dromble Media. Retrieved July 6, 2014. ^ "ATI Snags Dolphin Graphics Chip Designer". IGN. February 16, 2000. Retrieved June 25, 2014. ^ Satterfield, Shane (August 24, 2000). "Nintendo's GameCube Unveiled". GameSpot. Retrieved April 11, 2016. ^ "First Quarter Financial Results Briefing Q & A". Investor Relations. Nintendo Co., Ltd. July 31, 2009. Retrieved June 18, 2010. ^ "support.nintendo.com". Nintendo of America. Retrieved April 23, 2011. ^ a b Fielder, Lauren (May 16, 2001). "E3 2001: Nintendo unleashes GameCube software, a new Miyamoto game, and more". GameSpot. Retrieved July 8, 2013. ^ Hinkle, David (November 19, 2007). "Year one: GameCube vs. Wii". Joystiq. Retrieved July 8, 2013. ^ George, Richard; Thomas, Lucas M. (May 9, 2011). "Nintendo's History at E3: 2001". IGN. Retrieved July 8, 2013. ^ "Factor 5 worked with GameCube motion controller". Aussie Nintendo. July 28, 2007. Archived from the original on September 27, 2007. Retrieved July 6, 2014. ^ Thomas, Lucas M. (November 11, 2011). "Before the GameCube Arrived". IGN. Retrieved July 8, 2013. ^ Schneider, Peer (June 2, 2004). "The Legend of Zelda: Four Swords Adventures". IGN. Retrieved July 8, 2013. ^ East, Thomas (May 29, 2012). "Classic E3 moments: Nintendo reveal GameCube in 2001". Nintendo Magazine UK. Retrieved July 8, 2013. ^ "GameCube Slogan Revealed!". Nintendo World Report. September 3, 2001. Retrieved October 25, 2009. ^ "Kirby Air Ride". GameTrailers. Retrieved March 27, 2008. ^ "Nintendo sets GameCube price - May 21, 2001". money.cnn.com. Retrieved September 21, 2018. ^ "GameCube launches in Japan". BBC News. September 14, 2001. Retrieved July 8, 2013. ^ Sato, Yukiyoshi Ike (September 13, 2001). "Nintendo GameCube launches in Japan". GameSpot. Retrieved July 8, 2013. ^ Becker, David (August 23, 2001). "Nintendo delays U.S. launch of GameCube". CNET. Retrieved July 8, 2013. ^ Becker, David (November 29, 2001). "Nintendo reports record GameCube launch". CNET. Retrieved July 8, 2013. ^ "GameCube gets midnight launch". BBC News. May 2, 2002. Retrieved July 8, 2013. ^ Eggebrecht, Julian (April 22, 2002). "Factor 5 on Dolby Pro Logic II" (Interview). IGN. Retrieved June 24, 2014. ^ "Nintendo Confirms The GameCube Is Officially Dead". Spong. February 22, 2007. Archived from the original on May 20, 2018. Retrieved February 14, 2019. ^ "Nintendo ends GameCube support". MCV. February 22, 2007. Archived from the original on June 1, 2016. Retrieved January 16, 2011. ^ "Gaming Intelligence Agency - Interview with Greg Buchner". thegia.com. Retrieved November 25, 2018. ^ Hackman, Mark (June 12, 2001). "Nintendo GameCube Unwrapped". ExtremeTech. Retrieved July 9, 2013. ^ Shimpi, Anand Lal (December 7, 2001). "Hardware Behind the Consoles - Part II: Nintendo's GameCube". AnandTech. Retrieved July 9, 2013. ^ "GameCube 101: Graphics". IGN. January 16, 2001. Retrieved January 27, 2008. ^ Gray, Douglas F. (June 14, 2001). "Gamecube uncovered - IBM, ATI inside". PC World. Retrieved July 9, 2013. ^ "Gamecube: A Digital Wonder". IGN. August 23, 2000. Retrieved July 8, 2013. ^ "Matsushita allies with Nintendo on next-generation game console". May 12, 1999. Retrieved July 9, 2013. ^ Bonsor, Kevin. "How GameCube Works". HowStuffWorks. Retrieved July 8, 2013. ^ "Spaceworld 2001: Spicing GameCube Up". IGN. August 22, 2001. Retrieved July 9, 2013. ^ Berghammer, Billy (July 24, 2002). "Nintendo announces Platinum GameCube". Nintendo World Report. Retrieved July 9, 2013. ^ "Spice Up Your Life". IGN. December 3, 2001. Retrieved July 9, 2013. ^ "Iwata Asks: Nintendo 3DS". p. 3. Archived from the original on February 13, 2012. Retrieved January 11, 2011. Iwata: To go back a little further, the Nintendo GameCube system actually had 3D-compatible circuitry built in [...] Itoi: Nintendo GameCube did? And all the Nintendo GameCube systems around the world? Iwata: Yeah. If you fit it with a certain accessory, it could display 3D images. ^ Serrels, Mark. "The Gamecube and the Game Boy Advance Were 3D Compatible!". ^ Taljonick, Ryan (April 3, 2013). "The 100 Best Easter Eggs of All Time". Games Radar. Retrieved July 16, 2013. 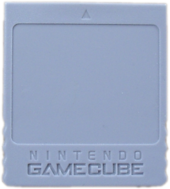 ^ "Nintendo GameCube Memory Card 1019". Nintendo. Retrieved July 12, 2013. ^ "Nintendo GameCube Accessories". Nintendo. Archived from the original on September 11, 2012. Retrieved July 3, 2009. ^ Plunkett, Luke (June 28, 2011). "The Evolution of the PlayStation Control Pad". Kotaku. Retrieved July 16, 2013. ^ Satterfield, Shane (November 16, 2001). "What's inside the GameCube?". ZDNet. Retrieved July 15, 2013. ^ England, Kyle (April 5, 2012). "The Legend of the Gamepad: A brief history of Nintendo consoles told with buttons and joysticks". Nintendojo. Retrieved July 15, 2013. ^ "GCN Controller: See it in Action". IGN. July 27, 2001. Retrieved July 15, 2013. ^ Graziano, Claudia (December 3, 1998). "'Nintendo Thumb' Points to RSI". Wired. Retrieved July 15, 2013. ^ Powers, Rick (October 6, 2001). "GameCube Controlle". Nintendo World Report. Retrieved July 15, 2013. ^ Wiley, M. (June 11, 2002). "Nintendo WaveBird Review". IGN. Retrieved July 15, 2013. ^ "Nintendo GameCube Game Boy Player". IGN. November 18, 2001. Retrieved July 16, 2013. ^ Humphries, Matthew (August 17, 2011). "Nintendo's new Wii drops Gamecube compatibility, bundles more games". Geek.com. Retrieved July 16, 2013. ^ Plunkett, Luke (December 13, 2012). "Tearing Open The New Wii Reveals Some Crazy Nintendo Decisions". Kotaku. Retrieved July 16, 2013. ^ a b Reece, Mark (November 18, 2011). "Feature: Remembering the GameCube". Nintendo Life. Retrieved July 19, 2013. ^ Hinkle, David (November 19, 2007). "Year one: GameCube vs. Wii". Retrieved November 24, 2018. ^ a b Yoder, Benjamin (July 21, 2011). "Will Nintendo Ever Get Third Party Support Right?". VGChartz. Retrieved July 19, 2013. ^ East, Tom (November 4, 2009). "History Of Nintendo: GameCube". Official Nintendo Magazine UK. Archived from the original on November 10, 2014. Retrieved July 19, 2013. ^ "Surf's Up official Press Release". Ubisoft. April 19, 2007. Retrieved April 18, 2007. ^ "Ratatouille official Press Release". THQ. November 6, 2006. Retrieved April 18, 2007. ^ "Disney Showcases E3 Lineup". Nintendo World Report. August 2, 2007. Retrieved April 18, 2007. ^ "Madden NFL 08 official Press Release". Electronic Arts. April 18, 2007. Archived from the original on December 29, 2007. Retrieved April 18, 2007. ^ a b c "GameCube Broadband/Modem Adapter - Feature". Nintendo World Report. Retrieved November 18, 2017. ^ a b "ダウンロード". konami,jp. November 19, 2005. Archived from the original on November 19, 2005. Retrieved November 25, 2017. ^ "Nintendo - Customer Service | Nintendo GameCube - Online/LAN". www.nintendo.com. Retrieved November 16, 2017. ^ "PSO Episode I & II for Xbox Returns - Phantasy Star Online Episode I & II Message Board for GameCube". GameFAQs. Retrieved November 6, 2012. ^ "Nintendo - Customer Service | Nintendo GameCube - Connecting over a LAN". www.nintendo.com. Retrieved November 16, 2017. ^ Thorsen, Tor (October 28, 2003). "DIY developers bring GameCube online". GameSpot. ^ "Nintendo Jumps Online". IGN. May 13, 2002. Retrieved July 21, 2013. ^ Ryan, Michael E. (November 15, 2001). "Nintendo GameCube: Review". PC Magazine. Retrieved July 22, 2013. ^ "Nintendo GameCube". CNET. November 18, 2001. Retrieved July 22, 2013. ^ a b "Nintendo GameCube is number 16". IGN Entertainment. Retrieved October 15, 2009. ^ "Xbox Vs. GameCube Vs. PlayStation 2: Torture-testing all the video game consoles--in one room, at one time". Popular Mechanics. December 7, 2004. Retrieved July 22, 2013. ^ a b c Frederick, Jim, and Toko Sekiguchi. "The Console Wars: Game On." Time International (South Pacific Edition) 49 (2003): 56-59. Business Source Complete. Web. July 24, 2013. ^ Hinkle, David (November 19, 2007). "Year one: GameCube vs. Wii". Joystiq. Retrieved July 21, 2013. ^ McCracken, Harry. "Play Hard. (Cover Story)." Time International (Atlantic Edition) 180.23 (2012): 48-49. Business Source Complete. ^ Ahmed, Shahmed. "Japanese GameCube sales figures". Gamespot. Retrieved December 8, 2017. ^ a b "GameCube sales hit $100m". BBC. November 21, 2001. Retrieved December 8, 2017. ^ "GameCube sales brisk". CNN Money. November 29, 2001. Retrieved December 8, 2017. ^ Ando, Mariko (November 29, 2001). "Gamecube sales surpasses Xbox, PS2". MarketWatch. Retrieved December 8, 2017. ^ Smith, Tony (December 4, 2001). "Nintendo GameCube sales on target to beat initial forecast". The Register. Retrieved December 8, 2017. ^ Dyer, Mitch (November 15, 2011). "Ten Incredible Gifts Xbox Gave Modern Gaming". IGN. Retrieved July 22, 2013. ^ Moriarty, Colin (February 16, 2013). "Sony's Documentary on PlayStation 2's Retail Dominance". IGN. Retrieved July 22, 2013. ^ Buchanan, Levi (September 29, 2008). "Nintendo 64 Week: Day One". IGN. Retrieved July 22, 2013. ^ Zackariasson, Peter; Wilson, Timothy L.; Ernkvist, Mirko (2012). "Console Hardware: The Development of Nintendo Wii". The Video Game Industry: Formation, Present State, and Future. Routledge. p. 158. ISBN 978-1138803831. ^ "Profit decline at Nintendo blamed on GameCube sales". seattlepi. May 22, 2003. Retrieved December 8, 2017. ^ "Eidos to Pull GCN Support". IGN. September 5, 2003. Retrieved July 12, 2007. ^ "Major UK retailer Dixons dumps GameCube - Geek.com". Geek.com. March 12, 2003. Retrieved November 24, 2018. ^ "Argos to drop GameCube". Eurogamer.net. Retrieved November 24, 2018. ^ "Nintendo GameCube Price Drops to $99!". Nintendo. September 24, 2003. Retrieved July 13, 2007. ^ "Nintendo GameCube Preview Disc". IGN. Retrieved August 7, 2015. ^ Henry Gilbert (August 1, 2013). "The Wii U Is the GameCube (but not the Virtual Boy)". GamesRadar. Retrieved August 7, 2015. ^ "The GameCube's Legacy to Nintendo and Gaming". Vooks. Retrieved March 9, 2017. Wikimedia Commons has media related to GameCube.